Petty Officer 3rd Class Lauren Steenson | USCG Jun 10, 2016. 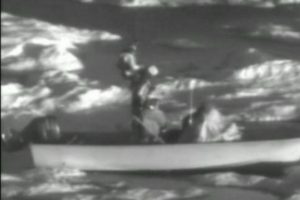 JUNEAU, Alaska — The Coast Guard rescued six hunters from two 22-foot skiffs approximately four miles north of Singeak early Wednesday morning. An Air Station Kodiak MH-60 Jayhawk helicopter crew hoisted three boaters from one skiff cut off from open water by ice. The aircrew then picked up the other three hunters from land and transported them to Shishmaref, approximately 122 miles north of Nome. The Alaska State Troopers contacted Coast Guard 17th District watchstanders Tuesday afternoon reporting that the two skiffs were beset in the ice while hunting for walrus and had lost communications with the ASTs. Air Station Kodiak launched an HC-130 Hercules airplane crew to locate the boaters and establish communications and an MH-60 Jayhawk helicopter crew to conduct the rescue. Weather on scene was reported as 10 miles of visibility, 9 mph winds, 34 degrees and overcast.